She was sleek, had attitude, was young but hated being told so, and with all of her life just waiting for her. Her skin shone. Her eyes were large and golden, her nose small and snubbed, her mouth generous. She was fresh and confident and tired of all her elders -- her parents (if they were even still around), her cousins, aunts, uncles, siblings and lord only knows who else who thought that they had a right to say how a proper family member should live. Comport yourself, they said, blinking and harrumphing all the while. Telling her to have respect for the rules of community, to learn from and revere their history, and, just as a matter of common sense, to take all due notice of, and live in accordance with, the lore and truth of the many warnings about the dangers that had always and would always plague their kind. She thought they were all just scaredy-cats when she was little, and then had to giggle because the last thing her people could be was cats! About as un-catlike as possible! As to dangers, well, it was true her brother lost his legs in a simply horribly awful way - died, of course - and also true that often many cousins were struck down and taken in a single night. The problem was that her people continued to stay in a place that was known as the place where they could be found. If that wasn’t dumb, she didn’t know what was. It made her pink with fury - and pink was not a good color for her. If she did speak up, it did no good. They all just plopped off. Too young, they’d say. Get yourself a passel or two of young ‘uns, then we’ll see. Well, that wasn’t going to happen. Not if she had anything to say about it. So, when she wasold enough to go off on her own without sending up the flag, she escaped. Left it all behind. And no, it hadn’t been easy. Food and safe places to hole up had been very iffy at first. But she’d adapted. She’d survived. And now she was going to drop back in on her family. Going home for a day. To pay her respects. Maybe get some respect herself after they saw how well she’d managed. And she’d start with those old stick-in-the-mud self-satisfied elders! She hurried along, the hint of coming rain no bother to her. She loved rain. How it made new grass feel all squelchy and how she loved to get muddy between her toes. She’d been letting the tall growth overshadow her way before, but now,coming closer to her old home, she stepped out. Excited, she decided, taking a couple of short hops. She’d show them. She took some longer hops and ended with a tremendous jump that landed her right underneath the absolutely most beautiful thing she’d ever seen. She stopped short. This was new. And it was gorgeous. Had never been there before. New life? she wondered. She looked up - she had to. It was a way long way up. Looked to be built on a single stilt, like a bird house, but not. Absolutely gorgeous. A kind of orangey-burgundy red with long yellow lashes of color. Three separate wings that she could see. And some kind of wondrous - what? Communication devices? Rising from it’s top? Like some pop-artist’s take on spears! It was - well, it was beyond imagination. She gazed longingly up. What she wouldn’t give to be able to say she’d been there. What a wonderful story to be able to tell. Even if she was only therefor a bit. Just long enough to get a bite to eat. And she’d give anything for a drink of water, she realized. A soft drizzle began just then and she knew she’d soon be damp all over. Gazing upwards again she thought she could maybe sneak up and get into that glorious place. She thought back to what she’d seen on her way here. Set in the niche beneath the old stone overpass was that small statue of her family’s eldest elder. Homely-ugly but impressive. What a coup to be able to brag to him about actually staying, even for a brief time, in a place like the one she was looking up at. So much better than what she’d come from. She was damp and cool, now. And very tired, she realized. If she could manage to sneak in up there, surely she was clever enough to be able to find a place for a short nap. She looked all around. What could she lose by trying? She was going to try it, she decided. She backed up, took another look around, set herself, and started for the exquisite palace, high above her. Her nap had been lovely. She’d found no one else around when she’d arrived at the palace itself. Perhaps it was so new there were no residents yet. Nor any staff. She’d tucked herself right into the central corridor and soon had been dreaming of being Queen of this place, her very own palace. -- And then she was falling, and falling, and falling. Ending, in a squishy plop into the middle of a puddle, the rain coming down hard now. She had been disoriented and frightened, even though the puddle’s water felt soothing. She looked up and all around and then saw her beautiful palace, sagging, its gorgeous wings closed, those mysterious “spears” disappeared, the whole flaccid, limp, wilting even as she watched. It was a daylily, she thought, disgusted with herself for being so easily tricked. Oh, she was back in home country now, for sure. And lacking in all the native savvy which once would’ve saved her such mortification. Show them how well she’d done! Teach them a thing or two! Surprise them with her know-how and town smarts! Well, she thought ruefully, evidently not so much. It was a good thing the home pond was close by. She needed food, comfort food. She needed a safe place she didn’t have to scout out. Somewhere to collapse. Like the daylily. Fade, wilt, cease to be, for a bit. She could steal in while they were all singing. They’d never hear her. Tomorrow she’d put the best face she could on things. If she were really honest, she might even be able to admit to herself that Singleton Adventuress isn’t all she’d thought it would be. It’d been hard, and scary, and often ugly. Definitely not easy. And definitely not romantic. Maybe the romance of adventure came after you were safely back home and could croak about it to your peers and especially to the young folks. Maybe she’d accept the embraces of amorous males after all. Have several passels of tadpoles, watch them grow up, have more - and then more - while she sat on lily pads, caught flies, hopped around the marshy pond edges, caught snails and worms, ate well, slept soundly and croaked with the best of them. Became a revered elder. She’d have stories to tell.She had many stories to tell. But never - NEVER - about being queen for a day in a beautiful and surreal palace of burgundy-red with yellow splashes and tall tall black-tipped spears. It didn’t turn out quite that way. It was a very long, long, lonnnggg first fall for her. And even longer winter. Though of course she was in hibernation. As winter approached, she dug herself a living space in damp earth beneath a ledge of buried rock at the edge of the pond, protected from both cold and predators. As winter set in fully, her systems slowed, her bodily fire burned lower and lower until a mere spark, her heart beat only at long intervals while her skin absorbed what oxygen she needed from her surroundings. She slept. With the return of life and Spring, she found herself back in the very things from which she had run. And though she accepted her duties - to produce clusters of eggs from which endless tadpoles would emerge, to accept the many thou shalt’s and thou shalt not’s from her elders, to sing nightly in the chorus, even to begin to prate and posture, she was unhappy. Unfulfilled. And terribly, terribly uncertain as to what she could do about it. She took to stealing away. Not to leave, but just to get a breath free of the pond and all the others. Oh the oh-so-many others. She always returned in just an hour or two. As Spring settled in fully it was beautiful. Black flies came and she feasted. Mosquitoes followed. And stayed. And she dined. Flies hatched and she ate. She still practiced long hops and high leaps, both to amuse herself and to remind herself of who she had been and who she became and who she now was. All of it. It all belonged to her. To her separate and solo self. As summer approached and then settled in for its stay, she took to wandering further, back along the way she’d taken on her return to home. She often would stop at the stone overpass and settle in to rest by the statuette of the pond’s eldest elder, now gone. Her city humor said he’d croaked, but her country sensibilities saw that for the jaded and cheap sophistry it was and instead she took silently to asking him for counsel. But nothing had ever come of it. She felt she just was told to go back. Return the way you have come, was the message she got. Nothing, she thought one early morning of what promised to be a long hot mid-summer day, ever changes. Not ever. Out of the corner of one large golden eye she glimpsed something. Something unknown yet familiar. Certainly different. She hopped back around to look more closely. It can’t be, she thought. It can’t. But it was. A day lily is a perennial. Once taking root, barring incident or accident, it would reappear every summer. It might last only from sunrise to sunset, but it would bloom fully in the length of that day. And, where there was one, in time there could be more. The first had only to send out a node which rooted to produce a second -- this new one, for instance - and so it would continue. Indeed, there above her stood an exact replication of her first palace, aflame in burgundy-red with slashes of yellow, tall black-tipped stamens and all. And there beside it stood a new, slightly different version, with less burgundy-red and wider yellow splashes, black stamen heads waving high above - fully as beautiful and surreal as its parent. I can do this, she thought. Be queen for a day again. Spend the one day of its life curled deep in its gorgeous heart. And no one -- no one but herself -- and the day lily -- oh and perhaps a butterfly or two, maybe a bumblebee -- need ever know. Her dream could still be made real. Perhaps her homely-ugly but very impressive eldest elder who no longer lived had heard her after all Perhaps this had been his intention in sending her back the way she had come. The way she had taken to return to her pond home and family. 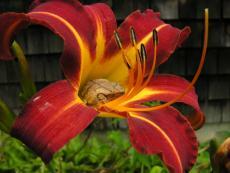 Perhaps this, this day lily secret, was a way to her self. In time, there would be a fan of them. She could have her pick. Year after year. One day. Her day. Together with the lily of her choice - its birthday. To celebrate together. She set herself and started once more to reach the exquisite palace that stood so high above. And in all of the rest of her thirteen years she kept her secret hidden and hidden very well. It was never discovered. Has never been known. In fact, has never told. --- Until now. I truly appreciate your comment. This unfolded as I wrote - to me, even. Thanks. Well, settle in. You'll have a couple of hours ahead of you. I've slammed a lot of stuff up on Booksie. And I will say again, I am pleased and I am honored that you are taking your time to spend with my people - only they aren't mine, of course - they are meant for and they mean to be read by you. Thanks, moonphish, a lot. Not to worry - there are, at last count, about 170 pieces posted here. And they range all over the place. It is most kind of you to come by and take the time to read and comment and particularly to compliment the writing in the way that you have. I am glad it pleased you. It was great fun to write! Loved this! I think I'll be reading much more of your work.